Now is the time of the year when anchovies show up at the fish market. And it's also the time when wild fennel grows in California. During May and June I pick the fronds and use them in various dishes (here is a recipe that I prepared last year using wild fennel), but my favorite is a pasta dish that combines wild fennel with fresh anchovies. The recipe didn't make it into my book, so I can give it to you! This is the time of the year for wild fennel fronds. Thank goodness that my parents moved to Northern California. I don’t know what we would have done without our wild fennel! The wild fennel that grows here in Northern California is the same variety, finocchietto selvatico, as the one that grows on the coastal areas of Southern Italy. I foraged for some yesterday while hiking on a trail with my husband. Wild fennel grows in empty lots, meadows, roadsides--just about everywhere. During the spring the green fronds sprout from the old roots of the previous year. They then grow throughout the spring and summer into tall cane-like stems. By July the plant blooms with yellow "flowers", that are, in fact, immature seeds that some people use to make “fennel pollen”. Wild fennel is not the same as the fennel that you buy at the farmers' market or at the produce store. In fact, wild fennel doesn’t resemble it in any way at all. The domesticated fennel has a large edible white bulb, which is wonderful raw in salads and cooked in many different ways. Its fronds have very little flavor. 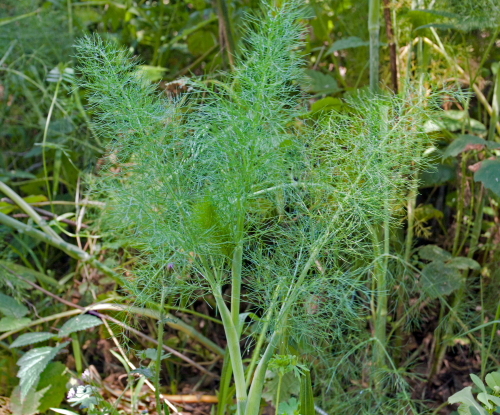 Wild fennel, however, does not produce a bulb. 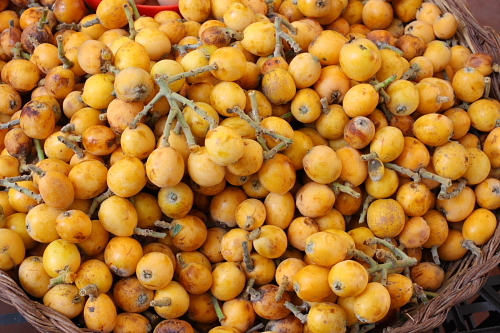 Its edible parts are the springtime fronds and the summertime seeds. It has a very distinctive flavor of sweet anise. When foraging for wild fennel don’t collect from the roadside or other locations where the plants are exposed to car exhaust or dogs. Go in the back of a lot or in areas where people don’t walk their dogs. Also take only a few fronds from each plant. Don’t remove an entire plant. I'll let you know how to forage for the seeds later in the summer when I have some photos. 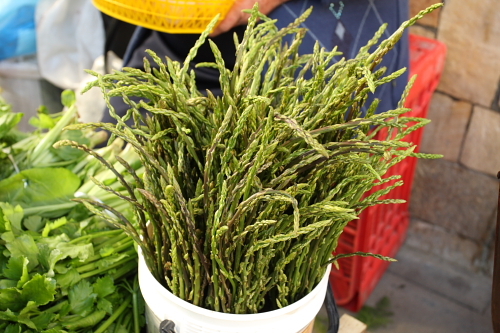 Many of you have eaten pasta con sarde, a dish from my husband's hometown of Palermo that requires wild fennel fronds. But Calabrians also eat the fronds. My grandmother would throw them in a delicious minestra made with various wild greens. And we use the seeds to flavor our cracked green olives, our cured black olives, and of course our homemade Calabrian sausage, both fresh and cured. I had included a pasta recipe in my cookbook that required wild fennel but it was removed because I was told that nobody outside California has access to it. Is this true? Those of you who live elsewhere, please let me know if you have seen wild fennel. I would think that it would grow on any coastal areas with mild weather. If indeed it doesn’t grow where you live you can buy the seeds from Seeds from Italy and grow your own wild fennel. But whether you have foraged for wild fennel or grown it from seed, give this quick pasta dish a try. Don’t replace it with domesticated fennel fronds as they don’t taste the same. Bring a large pot of water to boil. Boil the cleaned fronds for 10 minutes. Drain the fronds well, reserving the cooking liquid, and finely mince them as shown on the right side of the picture below. Remove the sausage from its casing. Break the sausage into small clumps with a knife. I used my homemade fresh Calabrian sausage, but you can use any sweet or hot Italian sausage. Brown the sausage with some olive oil. Add the minced cooked wild fennel. Season with salt. Cook the pasta in the reserved water that the fennel was cooked in. Drain and toss with the sauce. Here is the finished dish. So simple--only three ingredients--and yet so good! Wash the fronds well in hot water as they can harbor small insects. Bring 5 quarts (5 liters) of water to a boil in an 8-quart (8-liter) pot over high heat. Add the fronds and boil 10 minutes, then lift them out of the water and into a colander, reserving the water to cook the pasta. Drain the fronds well and finely mince. 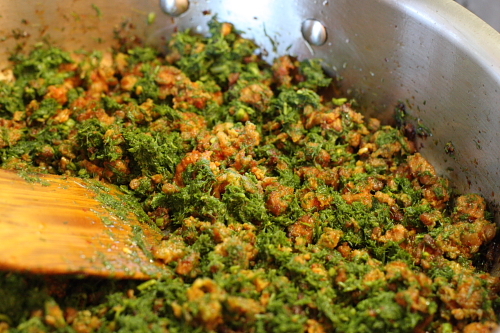 You should have 1/2 to 2/3 cup minced greens. Remove the sausage from its casing. Break the sausage into small clumps with a table knife. Heat the olive oil in a 10-inch (25-centimeter) skillet over moderately high heat. Add the sausage and cook until it is no longer pink and begins to brown lightly. Stir constantly with a wooden spoon, breaking up the clumps into smaller bits. Add the fennel greens and stir well to distribute them and coat them with the oil. Season with salt. Reduce the heat and keep warm. Add 1/4 cup (35 grams) salt to the water in which you cooked the fennel. Return to a boil and add the pasta. Cook until al dente. Set aside 1 cup (250 milliliters) of the pasta water, then drain the pasta and return it to the skillet with the sausage and fennel greens. Cook, stirring, over moderate heat for a minute or two to flavor the pasta, moistening it with some of the reserved pasta water. Serve immediately.